Concentrated sources of ionizing radiation are relatively new on earth, yet all living systems have had to deal with low levels of radiation. Thus, many plants contain a range of protective phytochemicals and this protection may be conferred to animals that eat them. 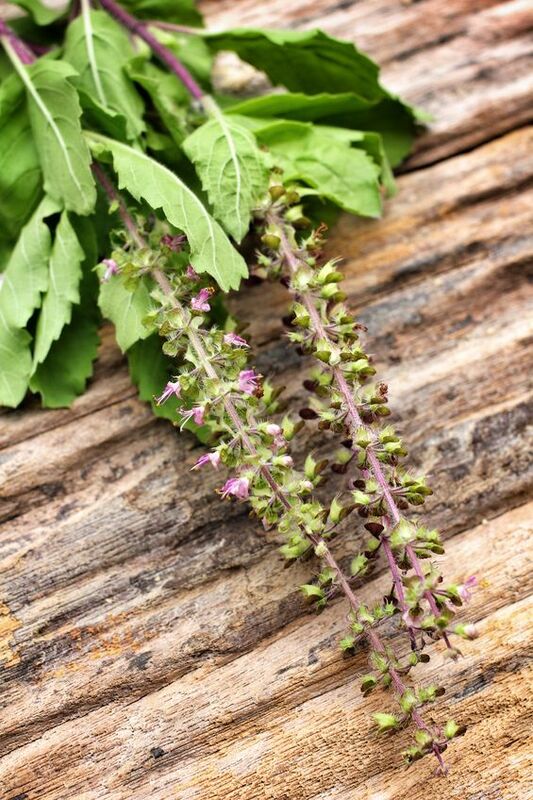 Perhaps the most potent plants in this regard are the ‘adaptogens’ such as tulsi (Ocimum sanctum or holy basil), which confer protection against a wide range of environmental stressors. Tulsi has been celebrated within Ayurveda for generations as an ‘elixir of life’, yet it seems likely that the use of tusi and other adaptogenic herbs will become even more important as the extent of global toxicity becomes apparent. Over the past half century, humanity’s use of radioactive material has led to widespread contamination of our environment. The global spread of radioactivity first came to light in the late 1950s and early 1960s when a citizen science, ‘Baby Tooth Survey’, collected tens of thousands of baby teeth from around the world. This survey, led by Dr Louise Reiss and scientists from Washington University, revealed that levels of strontium-90 in baby teeth increased more than 50 times after the commencement of nuclear weapons testing. This finding led to the recognition that nuclear material released in one region can be distributed globally and was instrumental in pressuring the US, UK and Russian governments to sign the 1963 treaty banning above-ground nuclear testing. Despite the abolition of above-ground nuclear tests, human-induced radioactive contamination of the earth has continued. The production of radioactive waste from nuclear power generation, use of depleted uranium in armaments and industry, and the unintentional release of radioactive material from accidents at facilities such as Three Mile Island, Chernobyl and Fukushima, have all contributed to an increase in human radiation exposure. The use of radiation in medicine has also increased sixfold since 1980  and there is an ever present threat of radiological or nuclear terrorism, or further catastrophic accidents that could place innumerable human lives in peril. Radioactivity is highly toxic to living tissues and may exacerbate the adverse effects of exposure to other chemical toxins and pre-existing disease. Radiation also has cumulative effects and is of greater risk to children and the unborn fetus, as well as having impacts on reproductive capacity, so that effects can be felt for generations. The adverse effects of radiation are primarily due to the ionization of biological molecules and generation of free radicals and reactive oxygen species. These chemical species are unstable and damage cells due to uncontrolled reactions with fats, proteins and DNA. While random cellular events induced by radiation are credited with the creation of superheros such as the Hulk and Spiderman, in real life such events are highly damaging to living cells and are more likely to induce cancer than confer superpowers. Tissues that have a high cell turnover such as the skin, gut, blood and immune system are particular susceptible to radiation-induced cellular damage, which manifest as burns, radiation sickness and cancer, such as the leukemia that killed Madame Curie. While it is impossible to totally avoid exposure to radioactivity, there are chemical agents that can help to cope with, or counter, its effects. The use of radio-protective chemicals has been explored since the 1940s in order to protect against the effects of nuclear weapons and radiological/nuclear terrorism. Radio-protectants are also sought to protect nuclear industry workers and astronauts from radiation exposure, and protect normal tissues from the effects of radiotherapy. Chemical radio-protectants are based on the finding that antioxidants present at the time of irradiation help scavenge free radicals before significant cellular damage occurs. It has also been found that chemical agents given after radiation exposure may assist in DNA repair, reduce inflammation and persistent radiation-induced oxidative stress and facilitate death (apoptosis) of damaged cells. Currently, amifostine is the only approved radio-protectant drug and this is rarely used due to significant side effects. There are however, many natural compounds with radio-protective activity. Such compounds include sulfhydryl-containing compounds and anti-oxidant nutrients such as vitamins C and E, beta-carotene, N-acetyl cysteine and selenium, along with a range of phytochemicals found in plants such as Ginkgo biloba, Vitis vinifera (grape seed), Camellia sinensis (tea), Curcuma longa (turmeric), and Ocimum sanctum (tulsi or holy basil) . Of the plants with radio-protective properties, tulsi is the most studied. Considered the most potent adaptogen within Ayurvedic medicine, tulsi is revered within India as being without equal for its medicinal and spiritual properties. Tulsi is also known to have potent antioxidant and anti-inflammatory activity and is recommended to be taken regularly to help the body adapt to a variety of stressors. Various laboratory and animal studies have found that tulsi’s radio-protective effects include reducing the oxidative and chromosomal damage induced by gamma radiation and radioactive iodine [3-10]. This has led to research to develop radio-protective medicines from tulsi and phase II human trials are currently underway at the Defense Research and Development Organization in India . The radio-protective effects of tulsi are, at least partly, attributed to its content of the water-soluble flavonoids, orientin and vicenin. Low doses of these flavonoids have been shown to protect against radiation-induced cellular damage in animal and human cells through increased anti-oxidant enzymes activity and free radical scavenging and reduced lipid peroxidation [4, 12-16].